Bif Bang Pow! 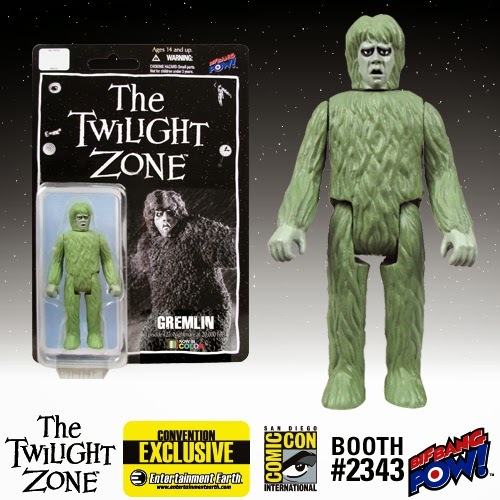 presents The Twilight Zone Gremlin 3 3/4-Inch Action Figure in Color, the horrifying creature from the memorable The Twilight Zone episode "Nightmare at 20,000 Feet" that starred William Shatner. You wish you had it before, so don't let it pass you by now! This authentically designed and rendered plastic action figure sports 5 points of articulation: neck, shoulders, and hips. He's fun to own but even more fun to play with! 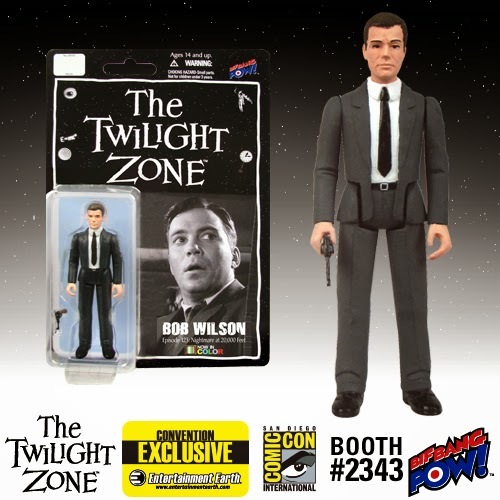 The Gremlin from "Nightmare at 20,000 Feet"
Limited edition color version 3 3/4-inch scale action figure of Bob Wilson from the memorable The Twilight Zone episode "Nightmare at 20,000 Feet" that starred William Shatner. Bob Wilson is the nervous airline passenger who sees a hideous Gremlin on the wing of his airplane in that iconic episode. This plastic action figure of a fan-favorite character is authentically designed and rendered, and sports 5 points of articulation: neck, shoulders, and hips. He brings a gun accessory, too! Bob Wilson from "Nightmare at 20,000 Feet"
Exclusive 3 3/4-inch scale action figure of the Invader, with 4 points of articulation: shoulders and hips. 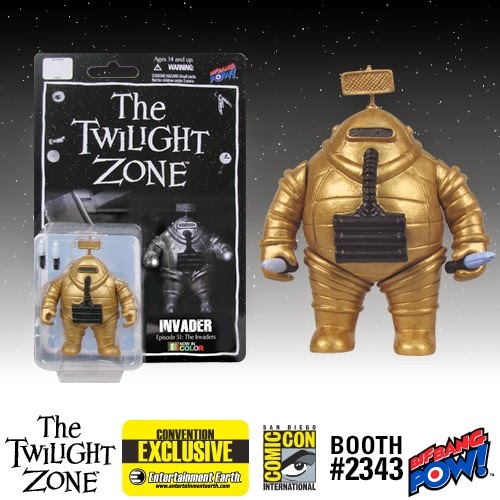 This is an authentically rendered action figure of one of those "tiny beings from the tiny place called Earth" in the memorable The Twilight Zone episode "The Invaders" that starred Agnes Moorehead. He brings and can hold two light-stick accessories that glow in the dark! This limited edition color version is an Entertainment Earth Convention Exclusive. The Invader from "The Invaders"
This authentically designed and rendered plastic action figure is the Kanamit, a considerably covert character set on adding mankind to his menu of delectable dishes in the rather disturbing The Twilight Zone episode "To Serve Man" from 1962. He brings a cookbook accessory and sports 4 points of articulation: neck, shoulders, and hip. In color and 3 3/4-inch scale, the limited edition action figure stands about 4 1/2-inches tall. 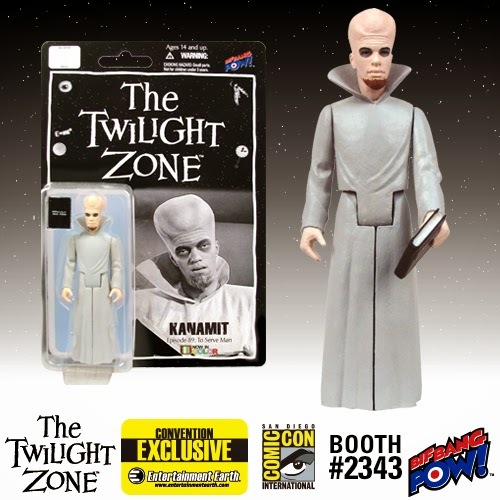 Kanamit from "To Serve Man"
It’s The Twilight Zone action figure you always wanted! This 3 3/4-inch scale action figure of Talky Tina is authentically designed and rendered, and sports 5 points of articulation. But don't worry, she's only a 2-inch tall action figure… or is she? 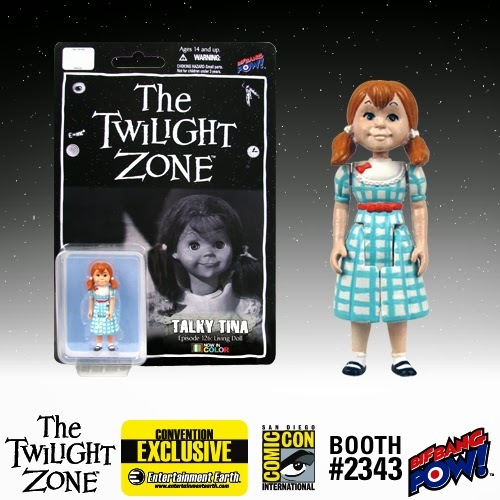 This limited edition color version Entertainment Earth Convention Exclusive features the popular character from The Twilight Zone's "Living Doll," one of the most spine-chilling episodes of the show ever aired, which also starred Telly Savalas. Talky Tina from "Living Doll"
Bif Bang Pow! 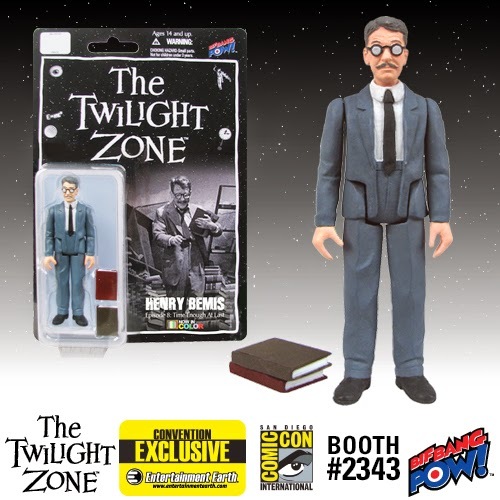 presents The Twilight Zone Henry Bemis 3 3/4-Inch Action Figure in Color, featuring a favorite character from the memorable The Twilight Zone episode "Time Enough at Last" that starred Burgess Meredith. This authentically designed and rendered plastic action figure sports 5 points of articulation: neck, shoulders, and hips. In color and 3 3/4-inch scale, it offers badgered booklover Henry Bemis, the nearsighted bank clerk, complete with two book accessories! Henry Bemis, from "Time Enough at Last"